Although the Rolex Oyster Perpetual Submariner is a sports watch originally developed for professional divers, you can also wear it in your board of directors meetings. The world's most well known 'spies' Sean Connery and Roger Moore wore the Submariner over and under water. The case is made from solid block corrosion resistant 904L steel alloy or 18 carat gold. The crown uses a triplock system keeping the mechanisms dry up to a depth of 300 meters (1000 feet); so it should have no problem with the pressures of your extraordinary lifestyle. The uni-directional bezel time marker makes sure that you don't stay too long under water, or in lengthy meetings. The Rolex Submariner is a line of sports watches, created by Rolex and designed to cope with the needs of both professional and amateur divers. Its history, however, can be traced all the way back to 1926 and the introduction of the Rolex Oyster; the brand's first ever water-resistant and dust proof wristwatch. Featuring a hermetically sealed case, which protected the timepiece's movement, dial and inner workings from water, the Oyster was famously worn during a swim across the English Channel in 1927 and passed the test with flying colours. Then, in 1931, Rolex upgraded the Oyster by introducing a perpetual self-winding movement. These innovations helped to pave the way for the introduction of the first Rolex Submariner models, which were produced in 1953 and showcased at the 1954 Basel Watch Fair. At the time, functional sports watches were becoming increasingly important and the Submariner had emerged as a descendent of the Turn-O-Graph tool watch. The first two Rolex Submariner models were the Reference 6204 and the 6205 and the two were introduced at around the same time. Interestingly, very few Ref. 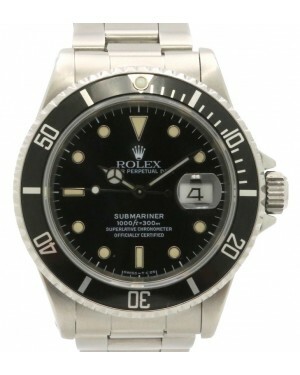 6205 models featured the Submariner name, while some 6204 models had the Submariner logo blacked out due to trademark issues with the name, which were later resolved. Benefiting from the manufacturer's Oyster case, with a screw-down crown, those early models were able to resist water at depths of up to 600 feet. In 1954, a small number of Reference 6200 Submariner models were also introduced and this particular model was significant, as it introduced the distinctive hour hand, often referred to as the 'Mercedes' hand, which is now so strongly linked to the Submariner collection. In 1955, Rolex updated the collection, introducing the Ref. 6538 as a successor to the Ref. 6204 and the Ref. 6536 as a successor to the 6205. Both featured an updated calibre 1030 movement, while the Ref. 6536 was notable for its over-sized crown. A chronometer version of the 6536 was also released and was designated the Ref. 6536/1. A military version of the Ref. 6538 was also released and used by both the British Royal Navy and the Royal Canadian Navy. For all intents and purposes, the model was the same as the standard production model, although identification numbers and service numbers were engraved onto the back. The year 1956 saw a few cosmetic changes, with the 6538 being updated to have the same case as the previously released Ref. 6200. This model was dubbed the Ref. 6538A. Meanwhile, the bezel was updated on all Submariner timepieces with the inclusion of a minute scale on the first quarter. Over the course of 1958 and 1959, a total of four new Submariner models were introduced. The first of these were the Ref. 5510, which was based on the 6200 and included an updated calibre 1530 movement, and the Ref. 5508, which was an updated version of the chronometer Submariner (Ref. 6536/1), with an updated font on the bezel. With the release of the Ref. 5512 in 1959, the case size was increased from 36mm to 40mm. This model, as well as the Ref. 6538 released in the same year, were the first Submariner models to have the words "Superlative Chronometer, Officially Certified" written on their dials. The Ref. 5513 was introduced in 1962, as an updated version of the Ref. 5512. It featured a new calibre 1530 movement and the design of the crown guard was altered slightly. The following year, the model was improved again, this time with the introduction of the brand new 1520 movement. In 1966, the company launched the Ref. 1680, which has since gone on to become a highly prized model. In addition to being the first ever Submariner to feature a date display window, complete with the trademark 'Cyclops' lens, the word 'Submariner' was written on the dial in red, rather than the usual white. This can be seen on all Ref. 1680 models produced before 1973 and is the reason why this timepiece is sometimes called the 'Red Submariner'. During the 1960s, the Submariner also became associated with James Bond. Indeed, Submariner timepieces were worn by Sean Connery in his first four James Bond movies - 'Dr. No', 'From Russia With Love', 'Goldfinger' and 'Thunderball' - as well as by George Lazenby, who took on the role for 'On Her Majesty's Secret Service'. This association would continue into the 1970s, as Roger Moore wore Submariners in his first two Bond films. 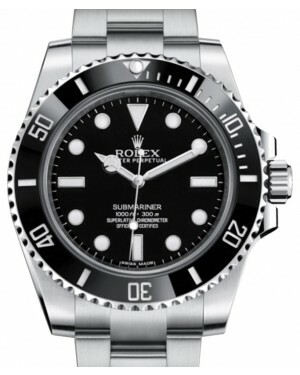 Starting with the release of the Rolex Submariner Ref. 16618 in 1969, new models were introduced far less frequently and the manufacturer began to experiment with different materials. 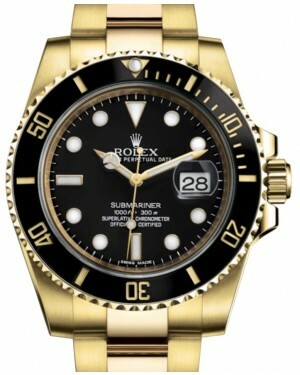 This particular model was the first Submariner model to be constructed from gold and it was followed by the Ref. 16800 in 1979, which featured a sapphire crystal. By this point, the water resistance of the Submariner had also improved to 300 metres. Meanwhile, in 1971, the Rolex Sea-Dweller was released. Derived from the Submariner and originally created to accommodate the needs of the needs of a deep sea diving company called Comex S.A, it featured a heavy duty steel case, a helium escape valve, a date display window and water resistance for up to 4,000 feet. In 1981, Rolex updated the Ref. 16800 to include a two-directional bezel. This feature was also included as part of the release of an updated Ref. 16618, which still featured a gold case. Then, in 1983, the company released the Ref. 16613 in its trademark two-tone 'Rolesor' combination of gold and steel. To mark the 50th anniversary of the original Submariner model, Rolex unveiled the Ref. 16610 LV Submariner in 2003. Featuring a green bezel, it became nicknamed the 'Kermit' and became a popular release. This was followed by the release of the Ref. 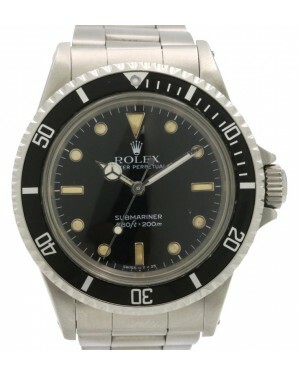 116613LB, which was another 'Rolesor' model, notable for being the first Submariner with a ceramic bezel. In the meantime, Rolex introduced the DeepSea Sea-Dweller in 2008, following on from the legacy of the original Sea-Dweller. The updated model featured a large 44mm case and water resistance for up to 12,800 feet. Then, in 2010, the company released two versions of the new Ref. 116610. The 116610LN is constructed from 904L stainless steel and features a black ceramic bezel, while the 116610LV features a green dial and green bezel. This model, continuing on from the success of the 'Kermit', would become affectionately known as the 'Hulk' Submariner. Over the years, the Rolex Submariner has been the favoured timepiece of various celebrity figures, politicians and even fictional secret agents, which has helped to add to its mythology and allure. Frequently identified as the watch belonging to James Bond, the Submariner was worn by Sean Connery throughout his tenure as 007. 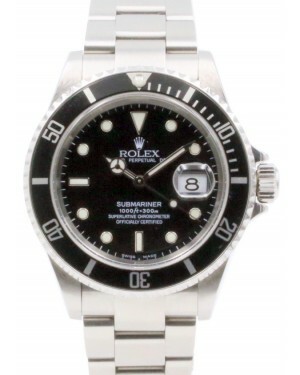 Indeed, it is so closely linked to the history of the character that the Submariner 6538 worn in films like 'Dr. No' and 'Goldfinger' is still referred to as the James Bond Submariner by many enthusiasts. Bond's taste in watches is shared by many celebrities in the real world, with one of the most famous examples being Steve McQueen, who was regularly seen sporting Submariner 5512 and 5513 timepieces. His association with the model was such that in 2009, a Submariner ref. 5512 owned by the actor was auctioned for $234,000. Other famous figures known to own and wear a Rolex Submariner include actors Johnny Depp and Sharon Stone, pop stars Adam Levine and Jessica Simpson, and even the Cuban revolutionary politician Fidel Castro. In fact, Castro wore a Submariner at the time he overthrew the dictator Fulgencio Batista during the Cuban Revolution. Therefore, it is fair to say the Rolex Submariner is a truly revolutionary watch, in every sense of the word. In the past, Rolex Submariner models featured aluminium bezel inserts, but these have been replaced by ceramic inserts on more recent releases. According to Rolex, the change was motivated by ceramic's more robust properties. However, with that said, both aluminium and ceramic have their advantages and drawbacks. One of the main hallmarks of the Rolex Submariner is its durability and the decision to move to ceramic bezels is certainly in-keeping with this. In general, ceramic bezel inserts can withstand more damage and are less likely to show scratches, which means they last longer and are less likely to need to be replaced. In addition to their robust nature, the ceramic bezel inserts also have a shiny quality, which adds to the overall aesthetic appeal of the watch. However, in rare instances where the bezel insert does become damaged, such as when extreme force is applied to them, ceramic is significantly more expensive to replace. Fortunately, these occurrences are extremely rare but nevertheless, the cost of replacement is considered a plus point for aluminium by some traditionalists. Since 1988, the Rolex Submariner has used a calibre 3135 self-winding mechanical movement, which has been designed and manufactured entirely in-house. Over the years, the calibre 3135 has undergone some significant upgrades, resulting in a highly-accurate movement, which allows for precision timekeeping. In fact, the movement is a certified Swiss chronometer, which means it has passed Swiss Official Chronometer Testing Institute (COSC) testing, such is its level of accuracy. This precision is aided by the movement's Parachrom hairspring, which provides excellent shock-resistance, as well as resistance to temperature changes. Furthermore, the calibre 3135 has a power reserve of approximately 48 hours. One of the major advantages of the Rolex 3135 movement, when compared to many other self-winding movements, is its free sprung balance, which results in greater accuracy than a standard balance bridge. Meanwhile, the combination of hand-made and machine-assisted production ensures the process is consistent. Generally speaking, a self-winding mechanical movement is considered highly accurate if it gains or loses around five seconds over the course of a single day. In laboratory testing, however, the calibre 3135 far exceeds this expectation, gaining or losing just two seconds in any 24 hour period, after casing. In addition to the core Submariner models, Rolex have released a number of special edition Submariners over the years, with some of the best-known examples being the '50th Anniversary', the 'Hulk' and the 'No Date'. Rolex's special edition models are produced for a limited period of time, enhancing their value and allure. Launched in 2003 to mark 50 years since the release of the first Submariner, the '50th Anniversary' edition stayed in production up until 2010 and featured a black dial and a unique green bezel. 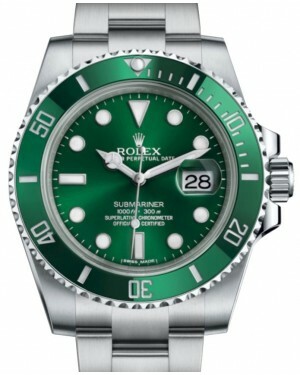 Green was chosen due to its historic connection with the brand and, as a result, it is sometimes nicknamed the 'Kermit' Submariner. 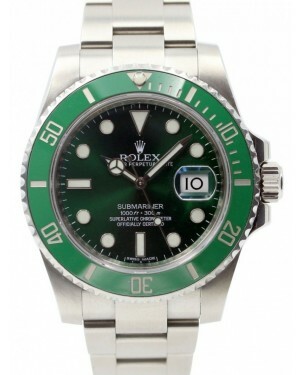 The 'Hulk' Submariner, introduced in 2010, evolved from the 50th Anniversary 16610 LV model, adopting its green bezel, but incorporating a green dial as well. 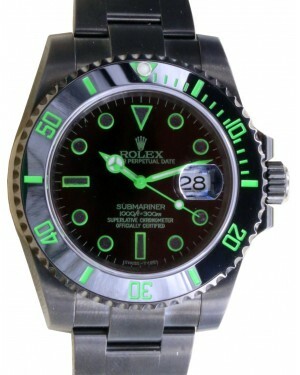 This colour scheme earned the watch its nickname, due to green's association with the Marvel character The Incredible Hulk, and the 'Hulk' edition quickly became a popular option. Moreover, Rolex have also released various 'No Date' models, which do not feature the date display window that has become such a strong Submariner trademark. These models include the ref. 14060, which was produced from 1989 to 1999, the 14060M, which was made from 1999 to 2012 and the 114060, which was introduced in 2012. Essentially, the 'No Date' Submariners provide a more 'pure' timekeeping aesthetic and offer greater symmetry. When purchasing a Rolex Submariner, there are a number of different colour combinations and materials to be aware of, from 904L steel models to 18k gold timepieces and even two-tone (Rolesor) options. In terms of 904L steel models, the Submariner 16610, 14060 and 116610 models feature a black bezel and black dial combination. The 16610LV model, nicknamed 'Kermit' and released to commemorate the line's 50th anniversary, has a green bezel and black dial, while the 116610LV, nicknamed 'Hulk' has a green bezel and green dial. The two-tone (Rolesor) models feature a combination of 904L steel and 18k gold and are also available in different colours. The Submariner 16613, for instance, is available with a blue bezel and champagne dial, blue bezel and blue dial, or black bezel and black dial. Meanwhile, the ref. 116613 also has a blue bezel and blue dial combination, but the blue on the dial is more pure than with the 16613, giving it a more uniformed look. 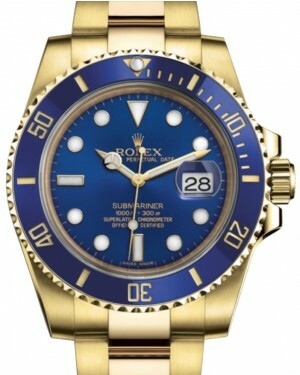 Finally, there are 18k gold Rolex Submariners, which are also available with different colour combinations. These include a yellow gold model with a blue bezel and blue dial, a yellow gold model with a blue bezel and champagne dial, a yellow gold model with a black bezel and black dial, and a white gold model with a blue bezel and blue dial. The Rolex Submariner is established as an extremely prestigious timepiece, which is able to serve as both a status symbol and a lifestyle purchases. 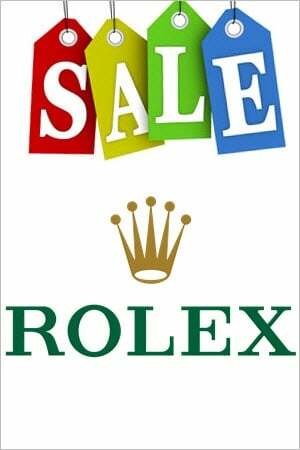 With that said, many people wish to own a Rolex without parting ways with huge sums of cash, so it is understandable that you may seek out the cheapest Submariner model available. For those hoping to pick up a Submariner for an affordable price, the second hand market is the ideal place to look and the stainless steel models represent the best options for newcomers. 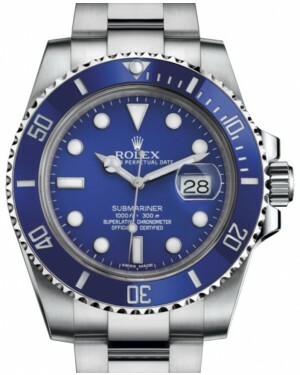 In particular, the Rolex Submariner ref. 16610 stands out as the most affordable model and a great entry-level purchase. In terms of appearance, the ref. 16610 is a clean looking Submariner, which features a black dial and luminescent hands and dial markers, offering excellent legibility. Both the case and the bracelet are constructed from stainless steel, which is able to fit in at any occasion, can be polished easily and is robust enough to last year after year. A high-quality Rolex Submariner 16610 will typically sell for upwards of $6,000, even on the second hand market. However, at Jaztime, we have used models available for as little as $5,199. 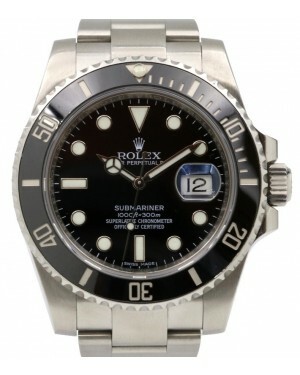 Of course here at Jaztime.com you will find the lowest price for your Rolex Submariner. 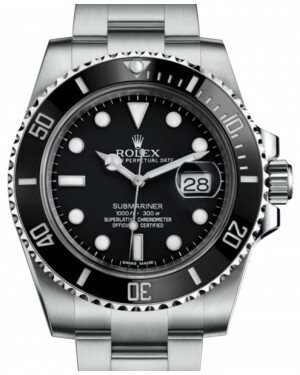 Nevertheless, if a real Submariner is too expensive, you can check out Tudor Black Bay Watches. Tudor is a Sub-Brand of Rolex with more affortable models at similar high quality. If you are looking to make a really bold statement with your new Rolex Submariner, you may wish to turn your attention towards the most expensive models in the collection, which are constructed primarily from 18k gold. In particular, the two most expensive Submariners currently available for purchase are the ref. 116618 and the ref. 116619, which are made from 18k yellow gold and 18k white gold, respectively. Both models feature date display windows, have blue ceramic bezels, come with 18k gold Oyster bracelets and have 40mm case sizes. Moreover, both models offer water resistance at depths of up to 300 metres, or 1,000 feet. The Submariner ref. 116618 and 116619 timepieces are both current production models, which are placed right at the top end of the Submariner collection. The ref. 116619, in particular, sits atop the tree, with brand new watches of this type typically retailing for in excess of $37,000. 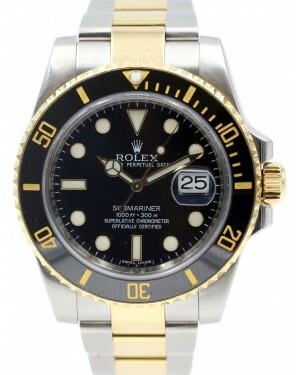 Rolex Submariners are robust watches, which retain much of their value for many years. 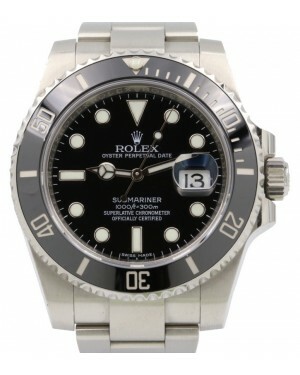 As a result, even used Submariner 116619 models can sell for as much as $30,000. Nevertheless, at Jaztime, we have a range of new and used Submariner 116618 and 116619 watches available for significantly less. Gold is only one way to make an extraordinary watch more beautiful. With diamonds you can customize your Rolex Submariner in any way you like: Diamond Hour Markers, Diamond Dial, Diamond Bezel or even a Diamond Bracelet are possibilities. If you prefer rather the stealth look, you can get a black DLC/PVD coating on your Submariner.